withdrawal(Extraction) sleeves can be used to mount bearings with a tapered bore on cylindrical seats of stepped shafts. The sleeve is pressed into the bore of the bearing that abuts a shaft shoulder or similar fixed component. The sleeve is located on the shaft by a nut or an end plate. Lock nuts or endplates are not supplied with the withdrawal sleeves. KM or HM lock nuts and respective locking washers are suitable but must be ordered separately. Further information will be found in the section "Lock nuts with locking washer or clip". To secure the bearing to the shaft, press the withdrawal sleeve into the bearing bore. To do this, particularly where larger bearings are concerned, considerable force is required to overcome the friction between the mating surfaces of the bearing and sleeve and of the sleeve and shaft. Mounting and dismounting of bearings on withdrawal sleeves can be facilitated considerably by using a hydraulic nut . ADP withdrawal sleeves are slotted and have an external taper of 1:12 except for those in the AH 240 and AH 241 series which have an external taper of 1:30 and are intended for use with wide bearings in the 40 and 41 Dimension Series. The nuts required for dismounting the withdrawal sleeve are not supplied with the sleeve and must be ordered separately. Appropriate sizes are listed in the product table. Appropriate hydraulic nuts for dismounting are listed there as well. 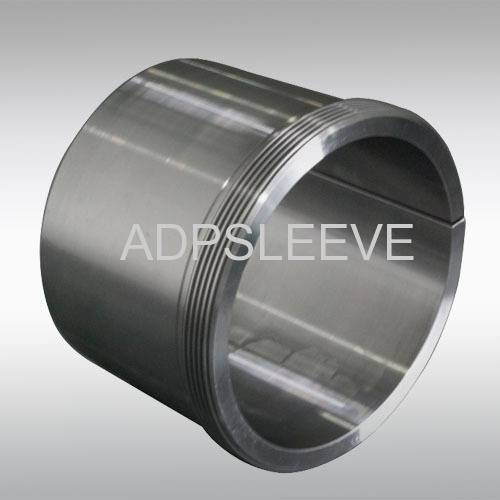 The materials using in ADP withdrawal sleeves are carbon steel with a tensile strength at least 430N /mm2. The dimensions of ADP withdrawal sleeves are in accordance with ISO 2982-1:1995. The bore diameter of ADP withdrawal sleeves is to tolerance JS9, the width to h13. ADP withdrawal sleeves up to size 38 have metric threads with 6g tolerances according to ISO 965-3:1998. Larger withdrawal sleeves have metric trapezoidal threads with 7e tolerance according to ISO 2903:1993. If standard nuts are not used, the threads of nuts for withdrawal sleeves up to size 38 should correspond to tolerance 5H according to ISO 965-3:1998. The threads of nuts for larger withdrawal sleeves should correspond to tolerance 7H according to ISO 2903:1993. As withdrawal sleeves adapt themselves to the shaft diameter, wider diameter tolerances can be permitted than for the seating of a bearing with a cylindrical bore. However, the form tolerances must be kept within narrow limits as the accuracy of form directly affects the running accuracy of the bearing. Generally, shafts should be machined to an h9 tolerance but the cylindricity should be to IT5/2 according to ISO 1101:2004.